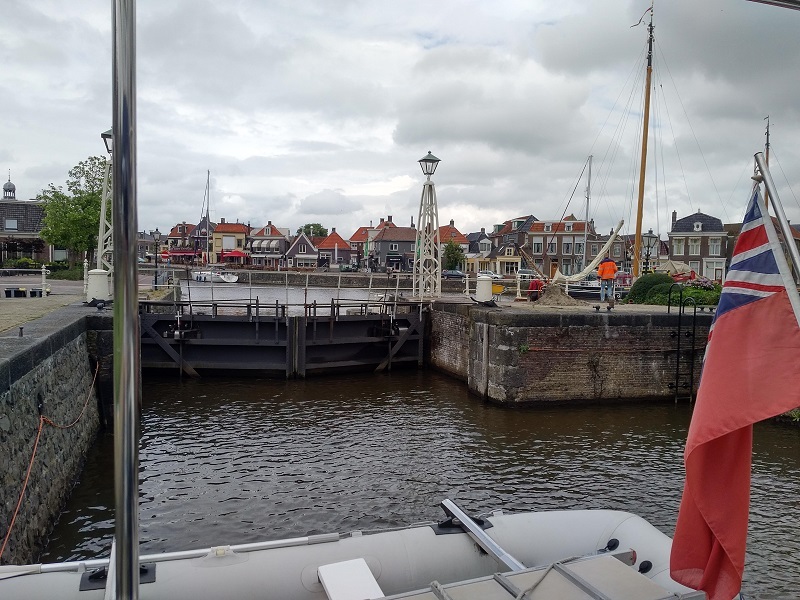 From Lemmer to Urk on a wet and windy day which continued so as the day went on, such that we were braving strong breezes gusting up to 20 knots on the eastern IJselmeer and a slight/moderate sea as we cruised down the coast from Lemmer to Urk. I reckoned that the breeze was going to moderate later and so I decided that we should have a slow start to the day. As midday approached, I prepared Lady Martina for an exposed trip by getting the canopy rolled back and raising the fenders before we took off eastwards along the Zijlroede towards the Zijlroeadebrug where the bridge-keeper kept us waiting a little while before opening; presumably in order to group boats together for the lift. 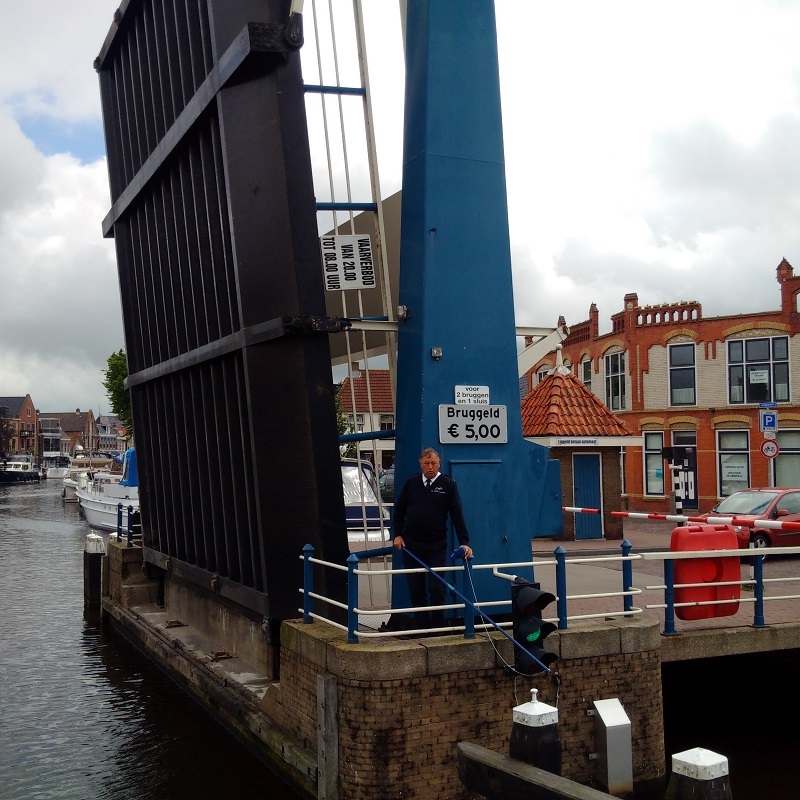 Then on to the Flevobrug where the bridge-keeper collected €5 in bridgegeld from us within his traditional clog on a 'fishing rod' before allowing us along the water front and towards the Oude Sluisbrug behind another yacht, which we accompanied for the 60cm rise through the Lemstersluis and out into the open IJselmeer. That is when the fun started which proved yet again (if we ever needed it) that you should never take this huge inland lake for granted. The wind had not abated at all and I was left tussling with the presence of a huge windfarm right in my way and completely absent from the charts (both paper and electronic) and the strengthening breeze of 16-20 knots. Thankfully, the direction was from the south and on the nose of Lady Martina as she rode the sea well and allowed me the necessary time and stability to more properly lash down our boarding ladder which had been loosely tied on to the davits. Kathleen was enjoying the sea-type experience as we cruised on and Lady Martina’s engines were getting some exercise again. 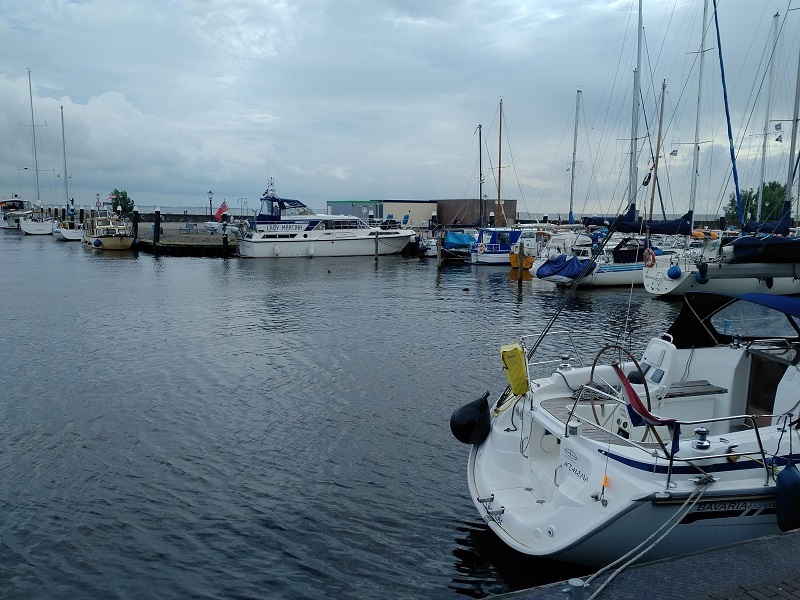 I gave the windfarm and the final Vormt shallows a wide berth and then wallowed in, beam against the sea, into Urk haven before making our entrance past the harbour moles, then the old fisherhaven (sadly emptied of fishing boats since I was last here) and then we left the inviting Nieuwe Haven and Oosthaven to turn to port and tie up on the edge of Westerhaven.